A few paces ahead, David Stein paused to catch his breathe on the trail. The Kaiparowits Plateau spreads south for 50 miles from the outpost of Escalante, Utah. The town is booming for the area. It’s got two grocery stores that are not open on Friday nights, about three restaurants that are open when the employees aren’t too busy scurrying around the surrounding canyons, and a post office where you can send mail to the town’s 767 residents. As the crow flies, Stein’s moonscape is not far from Escalante—only 35 miles or so—but we’d spent the better part of a day getting there. 26 miles on a dirt road by Jeep. 12 more miles with the transmission locked in four wheel drive. And two more miles battering the soles of our boots on a foot trail on the Kaiparowits Plateau. Grab your phone and find a map of Utah. Search for Jacob Hamblin Arch. Right now, our group is right there, perched several hundred feet above one of largest natural arches in the world. Now zoom out. Give it one, two pinches. On a larger scale, the plateau is part of Grand Staircase Escalante National Monument. If the name doesn’t ring a bell, its nearby neighbors might. Bryce Canyon, the Grand Canyon, and Zion National Parks are all within spitting distance of the Grand Staircase. In geologic terms, the Staircase is the body that ties together the more well-known park’s limbs. Recently, the national monument has made headlines as a hotspot in Washington, where politicians and appointees are busy taking a hacksaw to its borders. We were here to get a glimpse under the teeth of the blade. Two days ago, our group stared out from the top of Bryce Canyon. Looking southeast, we could see the Staircase on the horizon. Our intent was to spend two days backpacking through a hard-to-reach canyon inside the monument called Coyote Gulch. We were set to tote tents, supplies, and ourselves along a 22-mile route that culminated at Jacob Hamblin Arch, at the great stone monolith that now stood beneath our feet. How we got here, within site but not within reach of the arch, is a story of perseverance. As the sun rose on departure day, our four person Souled Outside Exploration Co. group awoke to bad news. One of us had come down with a rabid fever. Another bore the tell tale signs of conjunctivitis. Faced with an all day hike through freezing spring water, overnight temperatures in the low 30’s, and a campfire ban within Coyote Gulch, we knew we needed to call an audible. The new plan came together quickly: we would give the sick an option to stay at the hotel. The rest of us would split off and make for the direction of Coyote Gulch, but stop short of the final destination and spend the day hiking more accessible slot canyons. By noon, all four of us were wedged bone to stone against the walls of Spooky Gulch, a 3.2-mile slot canyon that narrows to about eight inches wide. Apparently, sickness is enough to deter an overnight trip without fire, but not enough to keep an adventure hungry group of explorers out of a day hike close to death‘s door. Armed with a Garmin InReach GPS, we were well-equipped to fend off getting lost in the wilds near Spooky, where several hikers have died in recent years. Nonetheless, the canyon presented some unique challenges for the Souled Out crew. On one occasion, Stein found himself hanging upside down between a bend in the slot after lodging his boot in an awkward position; still recovering from a broken arm, I had to one-wing it up a 20 foot sandstone cliff to enter Peek-A-Boo canyon, which enters into Spooky; and each of us faced a leap of faith down an eight foot chasm in the middle of the trail. By mid-afternoon, we’d all writhed our way out of Spooky Gulch with a sigh of relief. And, we’d made up our minds: if the fever broke in the morning, we would set out to Coyote Gulch on a shorter route. Instead of a 22-mile hike through Coyote Gulch, we would aim to reach Jacob Hamlin Arch via a shortcut. 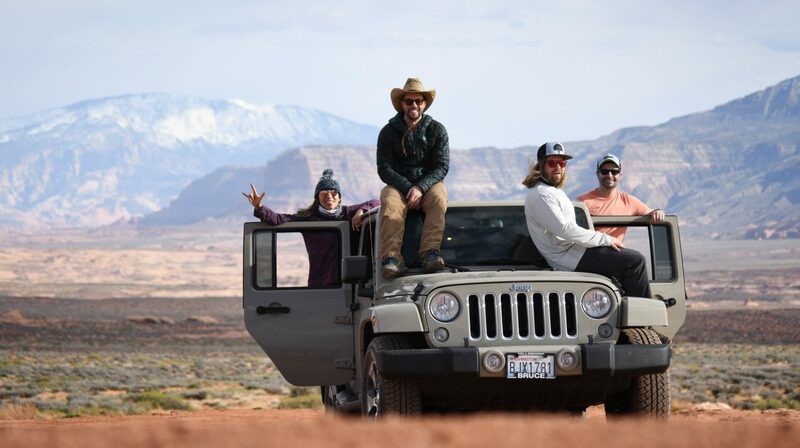 By using a Jeep to tame several miles of desert road extending beyond the originally planned trailhead, we would trim days off the hike and drop down to the arch via a rope attached to 45-degree, sandstone cliff. The hike would be just four miles round trip, but there was a catch—the climb in and out would be about 200 feet almost straight down. “I’ve got a wife and an 11-month old,” quipped Stein. “I’m still thinking,” I chimed in. “I’m down to go if you are.” chirped Jeremy. Ultimately, Jeremy and I gave the climb a shot. We roped up and practiced climbing up and down a 20 foot section of the great, red wall. Going down, we decided, was no problem. But getting back up? Some slipping and sliding in practice left us unsure. And so it was that on April 5, 2019, from a perch above a moonscape on the Kaiparowits Plateau, Souled Outside decided a climb down to Jacob Hamblin Arch wasn’t worth it. But that doesn’t mean the Arch itself isn’t worth protecting. Even from above, this stunning piece of architecture on the Grand Staircase is obviously a natural wonder. Chattering ravens nest in its cliffs and soar on the winds under its arms. Desert cacti bloom above its peaks. And down below, appearing almost as ants under a log, people have come from parts unknown to bask in its glow. In 2017, President Trump signed an executive order to cut the size of Grand Staircase Escalante by 47%. That order is currently embroiled in a lawsuit; however, should it go into effect, it would open places like the Kaiparowits Plateau—currently a public land that is free to access— to privatization and potential mining. After three days under the teeth of Washington’s saw, I’m now convinced that national monuments are in more need of protection than ever. It’s these places that offer adventurers the ability to truly get away from the crowds. We passed very few vehicles on the dirt roads leading into Spooky and Coyote Gulches. We encountered a fraction of the number of tourists found at the neighboring national parks, and found the landscape to be equally as incredible. Later that night, we eventually made our campfire. As we gathered around a fire-roasted Hot Pocket, the Souled Out crew traded stories about the Staircase, about Utah, and about how we needed to come back. As evidenced by the cuisine, you don’t have to be an outdoor pro to come here. You just need the will and a desire to go a little farther than everyone else. And you just need it to still be here when you decide to come. Find your way to Escalante, Utah. Bring a 4×4, rent one at a local outfitter or an airport rental agency. Drive 26 miles down Hole-in-the-Wall Road and continue on another 10 miles or so to 40-Mile Road. Turn left and drive to the water tanks on a hill, where the Sneaker Route trail begins. Alternately, park up the road at the Hurricane Wash trailhead and backpack in overnight. Bring plenty of water—a full 2L hydration pack for a day hike, and a filter if you plan to stay overnight in Coyote Gulch. The gulch is spring fed and offers water year round, but you should filter or boil it before drinking.